In writing about the artists and authors associated with Lake Chapala, I have collected a long list of enigmatic references to lesser known artists, whose life and work remain very much a mystery. In the hope that someone, somewhere, will be able to fill in some of the blanks, this post is about another of these “mystery artists”, about whom I would love to know more. Trude Neuhaus signature. 1919. Credit: Willem Eppink. Miss Trude Neuhaus (a German artist, dates unknown) is mentioned in the New York Times of 1 Nov 1925. She is reported to have brought to the Anderson Galleries in New York, “an exhibition of paintings, water colors and drawings of Mexican types and scenery” which had been exhibited at the National Art Gallery in Mexico City. The exhibition also included “Aztec figurines and pottery recently excavated by the artist in Chapala, Mexico”. The exhibit at the Anderson Galleries ran from 3-14 November 1925. The only auction record I’ve found for Trude Neuhaus is for a painting entitled “Indian mother and child” which sold in the U.S. in 1984 for $500. This Trude Neuhaus painting dates from 1919, before her visit to Mexico. Trude Neuhaus. 1919. Untitled, Credit: Willem Eppink. Can anyone tell me more about Trude Neuhaus, who it appears must have visited Chapala shortly after D. H. Lawrence, and at about the same time as Everett Gee Jackson was living there? My sincere thanks to Willem Eppink (see comments) for allowing me to use these photos of a Trude Neuhaus he owns. Comments, corrections or additional material related to any of the writers and artists featured in our series of mini-bios are welcome. Please email us or use the comments feature at the bottom of individual posts. 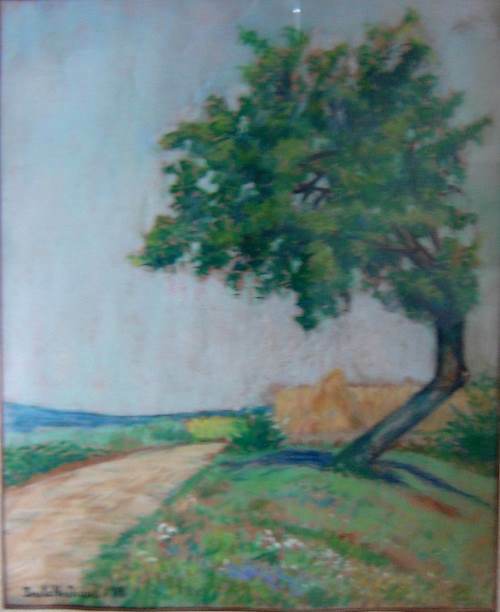 I have an older painting, signed Trude Neuhaus, and it shows a tree in a landscape. If you are interested, please email me. Thanks, Willem; I have emailed you.